Since version 3.0.9, Dolphin Viewer has “local bitmaps”, imported from FireStorm. This feature is an implementation of STORM-64 and allows another way to see your freshly created texture in-world without having to upload it via payment or temp texture while you are working on a project. There is no upload at all, so a local bitmap shows up instantly and does not put strain on the asset server, but this also means that no one else can see it – other residents will see gray. Local bitmaps can be configured to auto-refresh every time the file on your local hard disk changes, for example when you save it in your image editing application. Local bitmaps are gone from your viewer once you relog, just like temp uploads. The local file on your hard disk stays, of course. Open the Texture Picker (either in the build dialogue or edit clothing dialogue). The texture picker now has two tabs, “Server” and “Local”. To use a local image file from your computer, simply click the “Add” button and select a file. 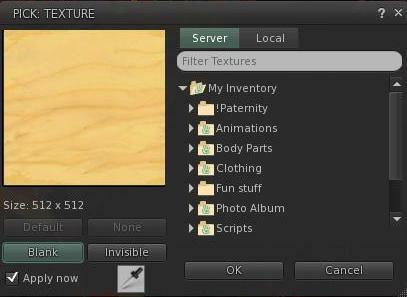 It will show up in the list on the “Local” tab, and be selectable as a texture for an in-world object. 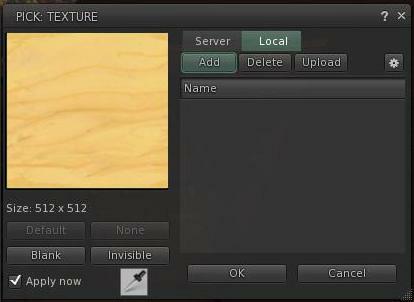 Keep in mind that other residents will see gray instead of the texture, and that this texture will not be listed anymore once you relog. To set up a local bitmap to auto-refresh, you have to add it first, like described above. Then, you click on the button with the little gear on the Local Bitmap tab, to open the “Local Bitmap Browser”. Select the texture in that list, click the checkbox next to “Autoupdate as” on the right, and select the right asset type, and the in-world object that you textured with this bitmap will refresh every time you overwrite the file. The “Upload” button on both the Local Bitmaps tab and the Local Bitmaps Browser is for uploading a file from your list of local bitmaps to the asset server so that others can see it properly too. This upload costs the usual 10L$.